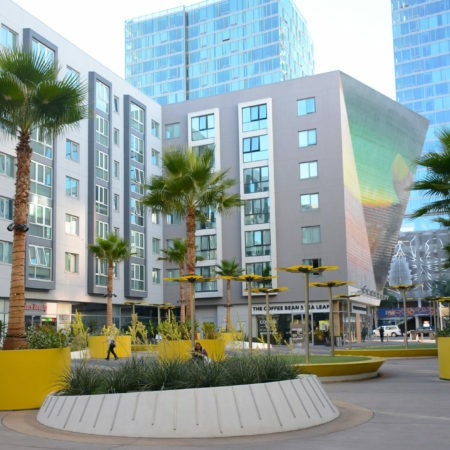 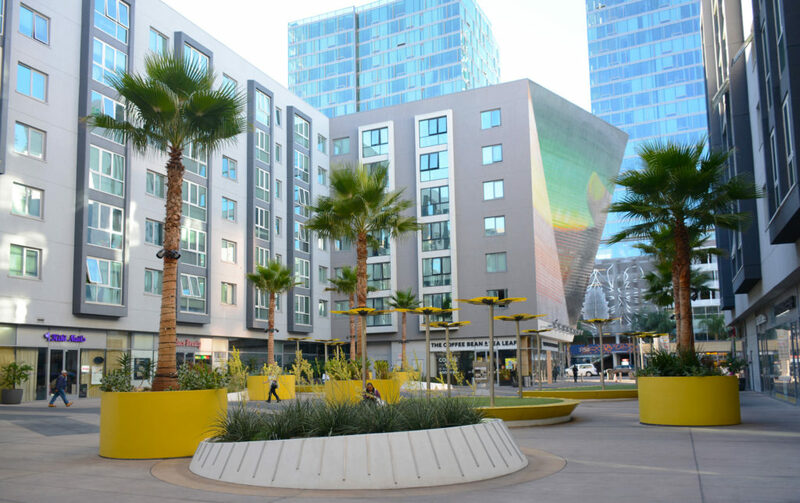 This mixed-use transit village in the heart of Koreatown sits atop the Wilshire-Vermont metro station. 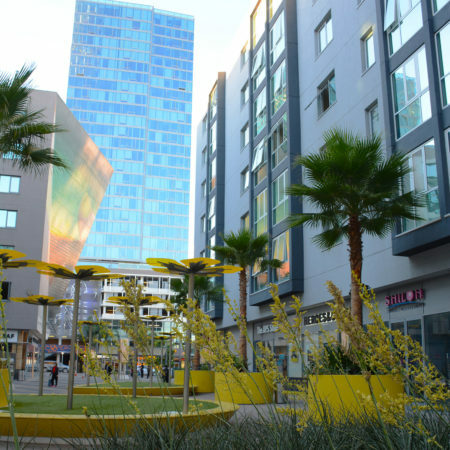 A 7-story building, filled with store fronts on the ground level and apartments on higher levels, surround the plaza. 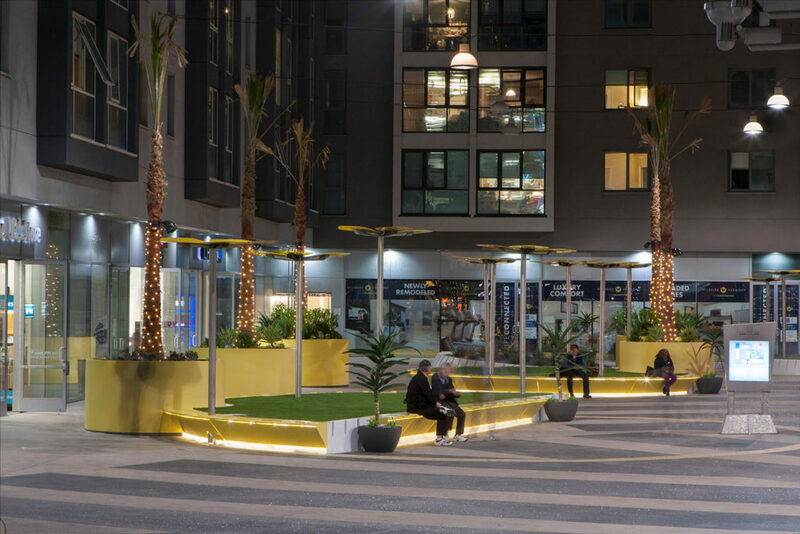 This plaza has a high volume of pedestrian traffic with over 15,000 people walking through it daily as it is between the metro station and bus stops on the street. 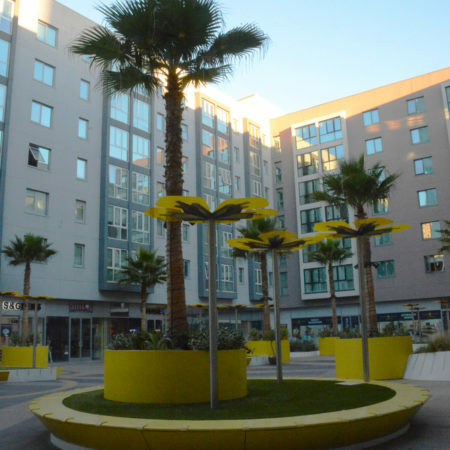 The plaza did not offer much in the way of amenities aside from a few planters. 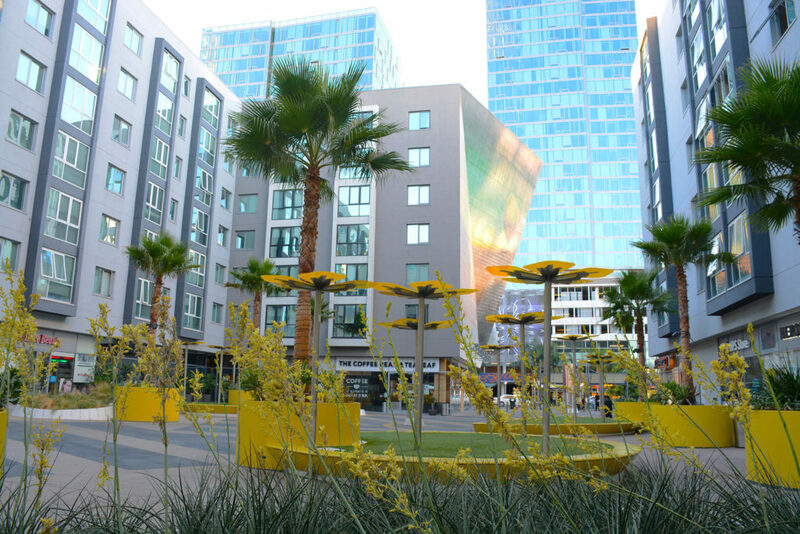 We were hired to make the plaza lush and inviting for the young urban residents. 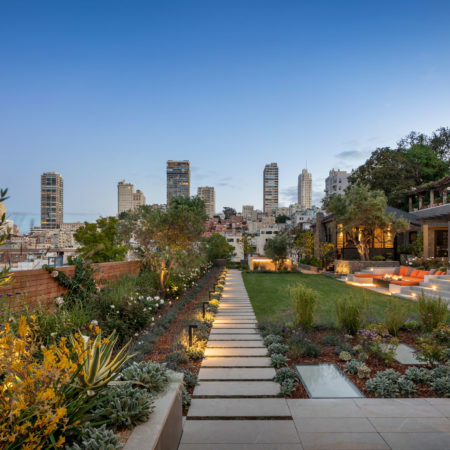 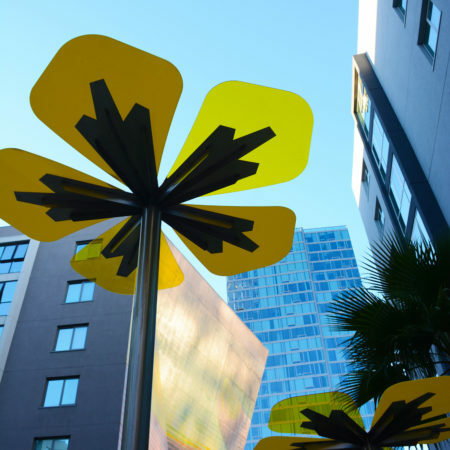 Our design decisions were informed by a few important factors: a 35 feet wide emergency access strip from the street to the subway had to remain clear, while our tree placement was limited to being planted on top of structural columns that could bear its weight. 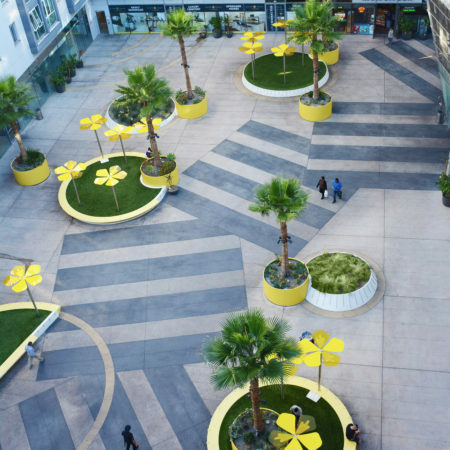 The plaza, constructed on a podium with restrictive load requirements, called for an intensive use of creative “planting” solutions. 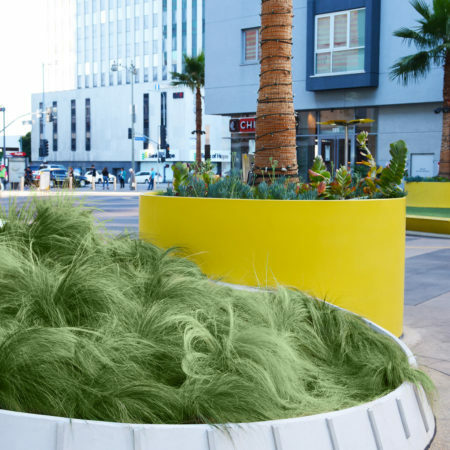 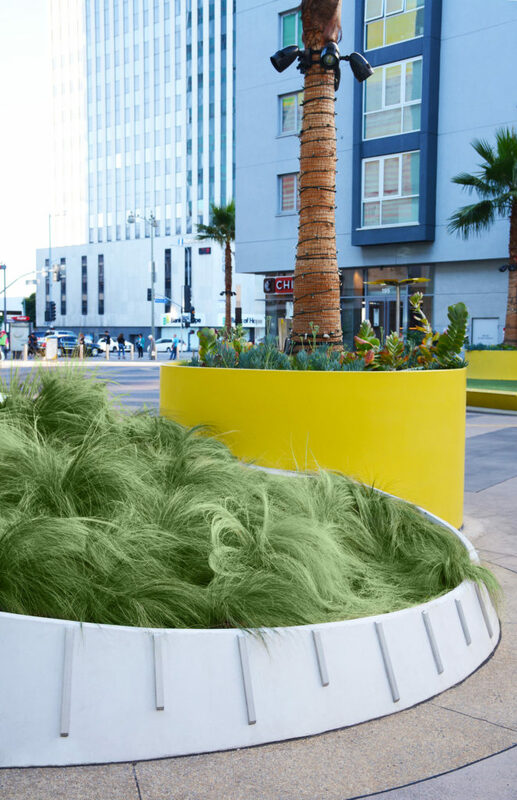 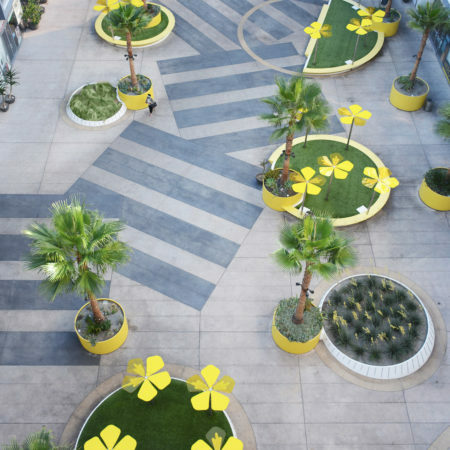 We introduced more green into the plaza in the form of artificial turf in circular shapes with colorful benches and bold planters with cheerful plantings. 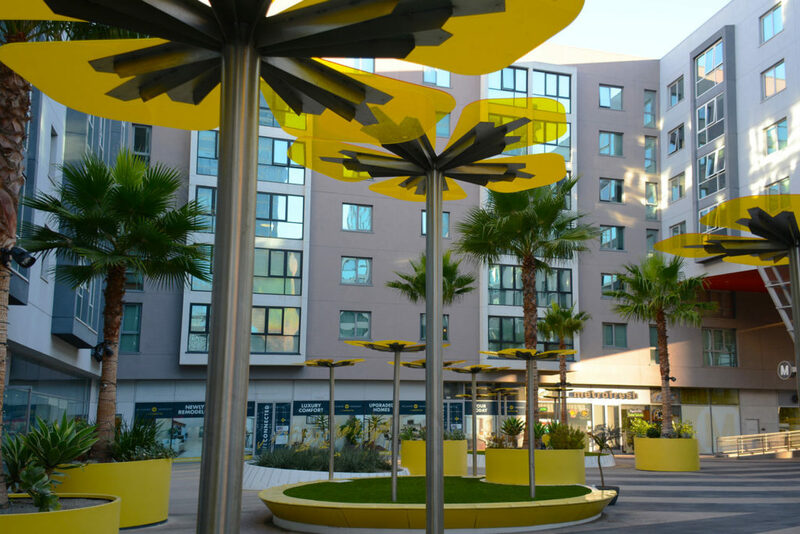 Our plant palette was extremely restricted as the plants had to endure extreme heat from the building’s reflective surface, while being able to tolerate everything from bright sun to deep shade from the building’s shadow. 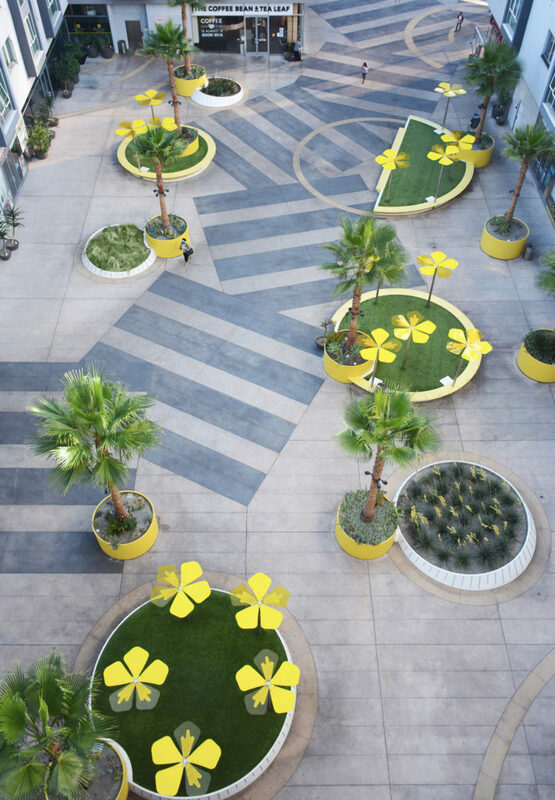 In lieu of broad tree canopies, bright yellow shade structures in the shape of Korea’s national flower, the rose of Sharon, add playfulness and color to the plaza. 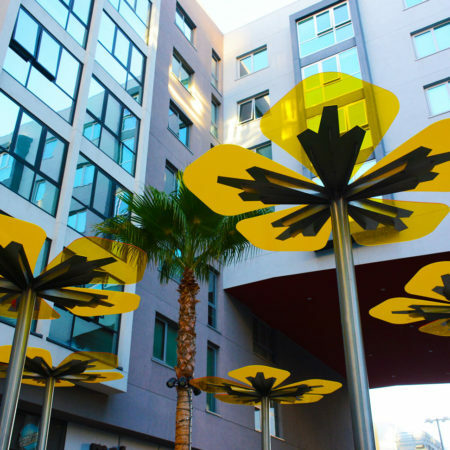 The palms and flower shade structures add verticality to the space, helping to mitigate the oppressive height of the surrounding buildings. 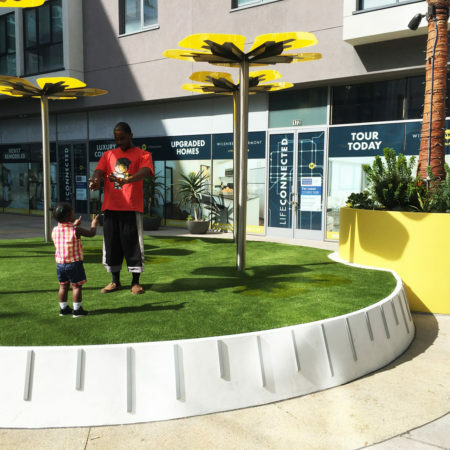 Now, residents, shoppers, and Metro riders have a place to have lunch, wait for a friend, or people watch. 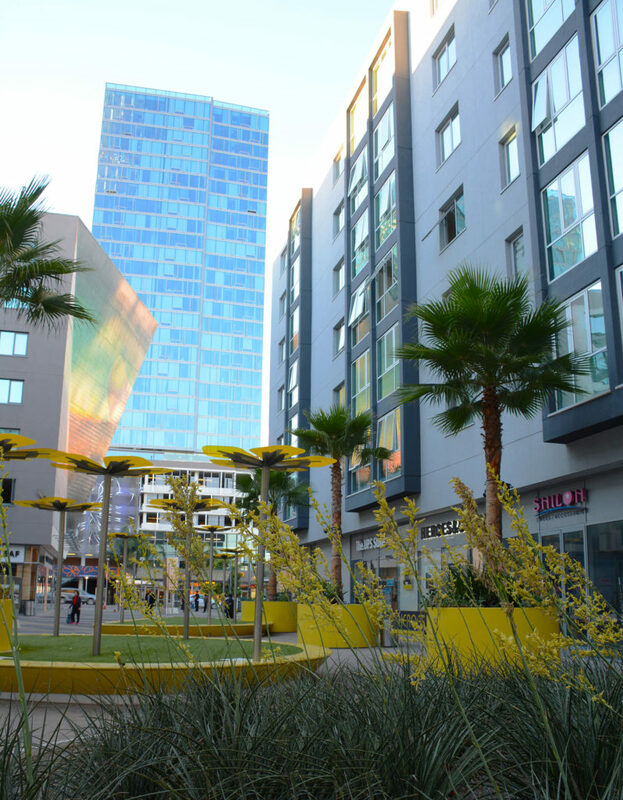 The client requested a more inviting space for residential and commercial tenants of the building. 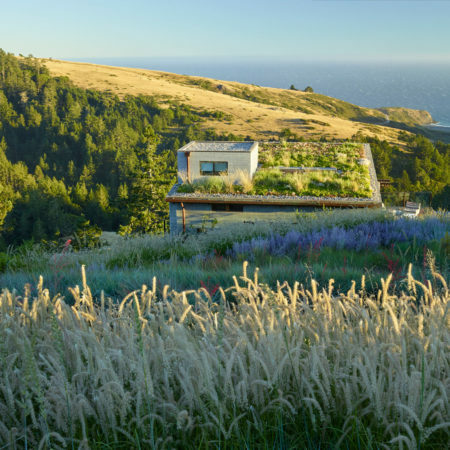 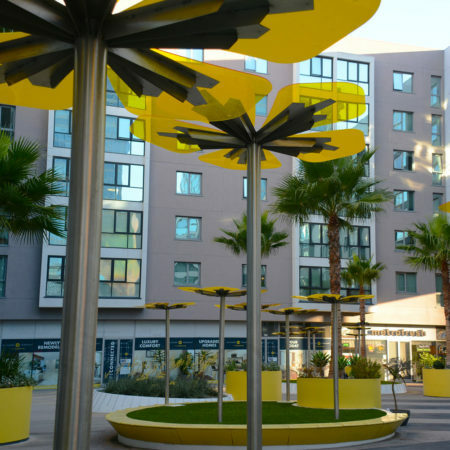 The primary challenges included coming up with a design that respected the Metro’s 35 feet wide emergency zone, weight restrictions, and did not penetrate the existing structural slab. 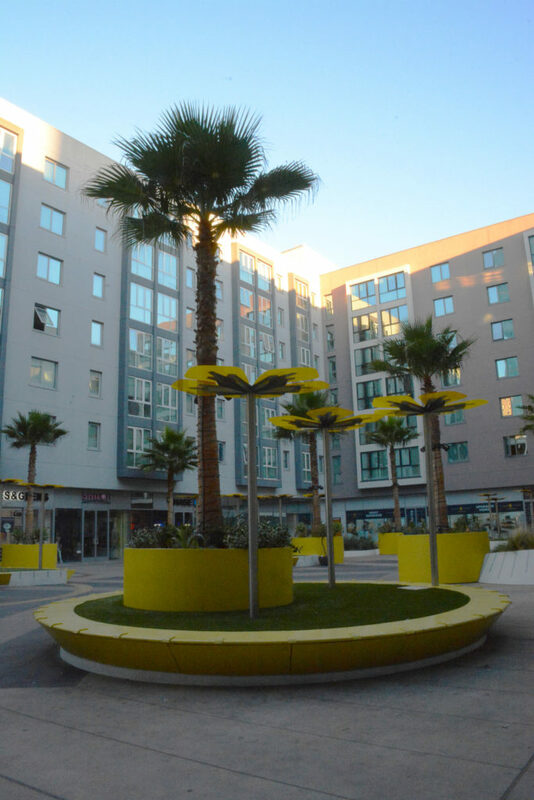 Our aim was to create a more lush and colorful plaza that enlivened the mixed-use village. 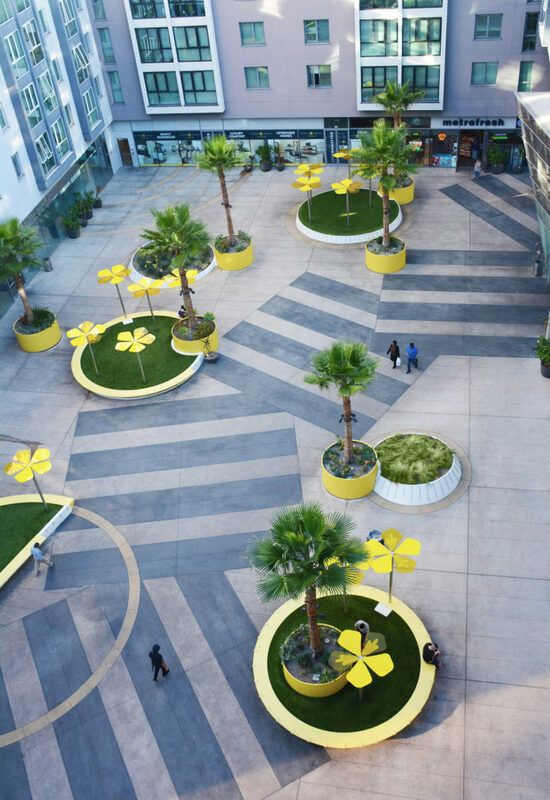 We created a dynamic space by juxtaposing the existing linear paving pattern with varying circular elements that are used for seating, play and planting. 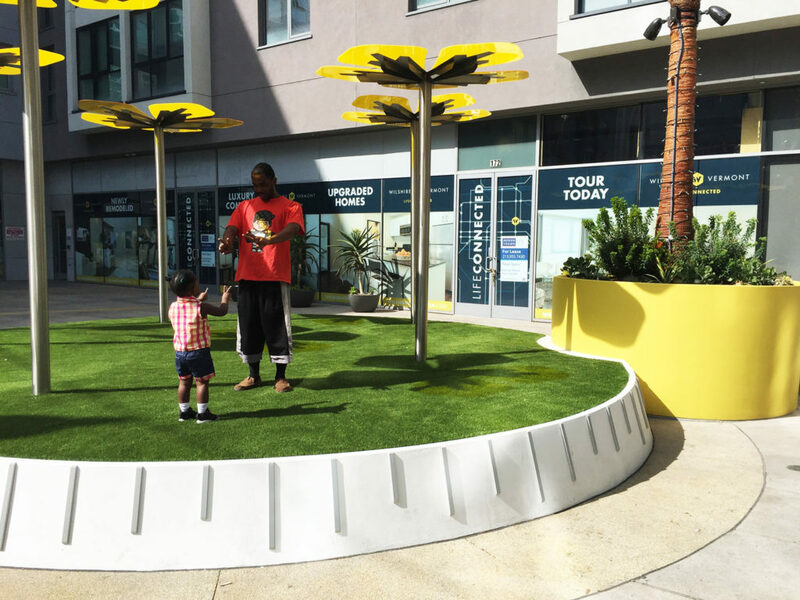 Circular raised artificial turf lawn areas create informal seating and play areas. 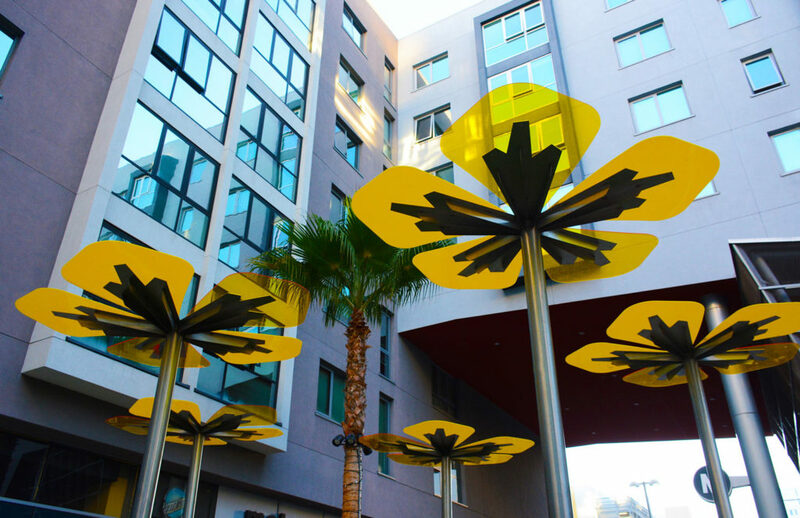 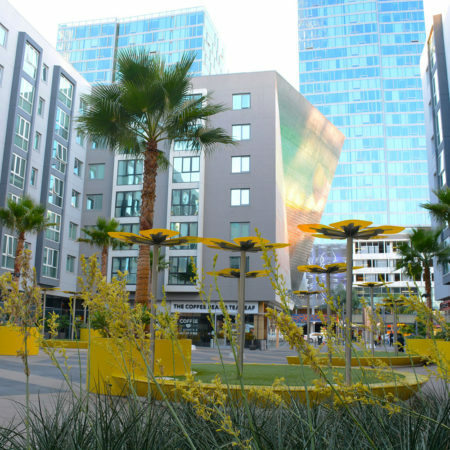 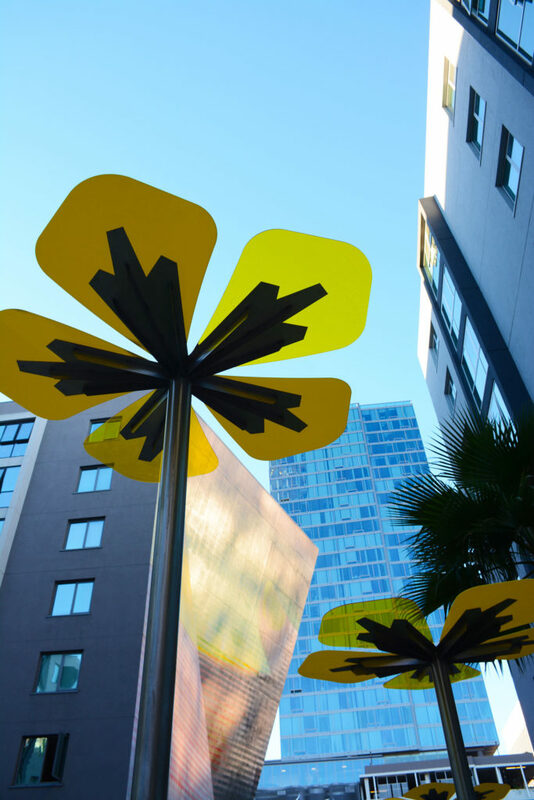 Whimsical shadows are cast over the plaza by bright yellow flower shaped shade structures that serve as vertical and color accents amongst the surrounding large grey building. 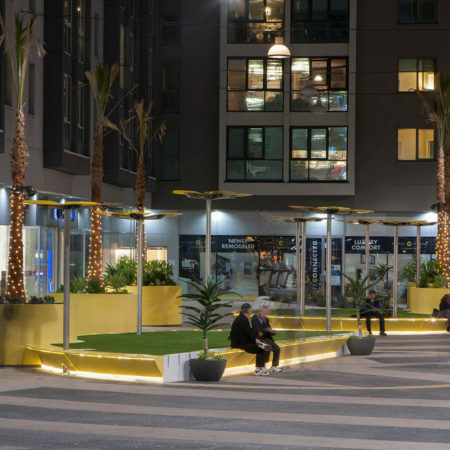 Stainless steel skate stopper bars are mounted to the side of the planters in a stripped design to deter skateboards from damaging the planters. 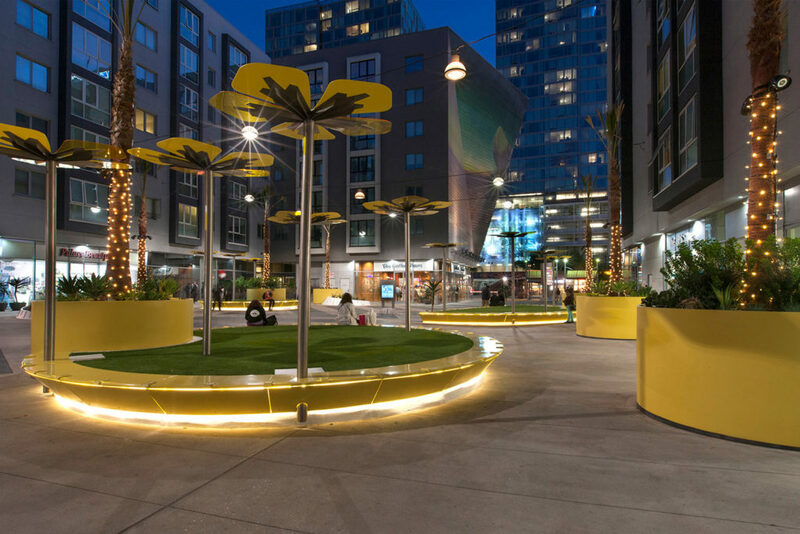 At night, new lighting design not only offers safety, but activates the plaza for continued use. 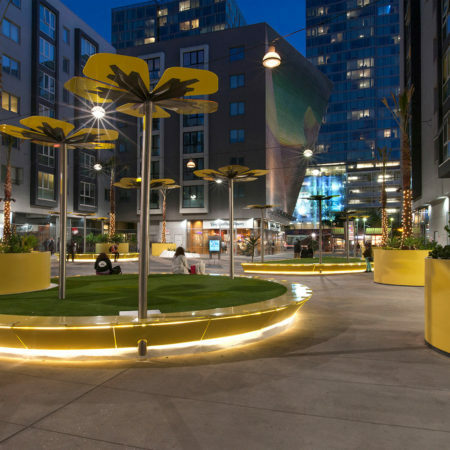 Sited in the middle of Koreatown, this plaza creates a unique space for relaxing and enjoying the urban pulse in the heart of Los Angeles.